Congratulations on being selected to run in the 46th Annual Western States 100-Mile Endurance Run on June 29-30, 2019. This document contains information from the website that you must be familiar with. This includes the risks of running, the rules, and the race week agenda. All of this is available on the website as individual pages but we’ve gathered them here in one document. Print this out if you want but know that the most current version of this is always on the website. The Western States Endurance Run is conducted along the Western States Trail starting at Squaw Valley, California, and ending in Auburn, California. The Run begins at 5:00 a.m. on Saturday of the last full weekend in June at the west end of Squaw Valley. Runners must reach the finish line no later than 10:59:59 a.m. on the following day in order to be eligible for an award. All entrants must strictly adhere to the Performance Rules, Rules for Pacers, Rules for Crews and to the pre-event briefing by Run Management to avoid disqualification and to remain eligible for an award. The Western States Endurance Run follows the middle portion of the famous Western States Trail, a nationally dedicated recreational trail that stretches from Salt Lake City, Utah, to Sacramento, California. One of the most arduous organized running events in the U.S., the Western States 100 is truly the “Ultimate Challenge” for the long distance runner. Entry in this event should not be taken lightly! Beginning in Squaw Valley, site of the 1960 Winter Olympic Games, the trail ascends from the valley floor (elevation 6,200 feet) to Emigrant Pass (elevation 8,750 feet), a climb of 2,550 vertical feet in the first 4½ miles. From the pass, following the original trails used by the gold and silver miners of the 1850’s, runners travel west, climbing another 15,540 feet and descending 22,970 feet before reaching Auburn, a small town in the heart of California’s historic gold country. Most of the trail passes through remote and rugged territory. People who are unfamiliar with the area should use caution when planning training runs, especially in the high country. Before leaving, let someone know where you will be running and when you will return. REMEMBER THAT MUCH OF THIS TERRITORY IS ACCESSIBLE ONLY BY FOOT, HORSE OR HELICOPTER. Due to the remoteness and inaccessibility of the trail, the Western States Endurance Run differs substantially from other organized runs. Adequate mental and physical preparation are of utmost importance to each runner, for the high mountains and deep canyons, although beautiful, are relentless in their challenge and unforgiving to the ill-prepared. Course Route: The Run will follow the same basic course used since 1986 unless snow conditions force a route change. Familiarity: Knowledge of the trail offers both physical and mental advantages during the Run. Participants should make a reasonable effort to run as much of the trail as possible before Run Day. Particular attention should be given to those sections that you expect to run in the dark, when your mental and physical energy may be lagging. After Dark: AS ALMOST A HALF OF THE TRAIL MAY BE TRAVELED AT NIGHT, EACH RUNNER SHOULD CARRY TWO LED FLASHLIGHTS. If your lights fail, wait for another runner with a light. Do not try to find your way in the dark. If you are the last runner, wait for the Search and Rescue sweep teams. Plan to pick up a flashlight in Foresthill, regardless of what time you reach that point. If you are a 28 to 30-hour runner, plan to pick up a flashlight in Michigan Bluff. Weather: Since temperatures during the Run can range from 20 degrees to above 110 degrees Fahrenheit, participants should be fully prepared for both extremes. Weather conditions are unpredictable and can change rapidly. River Crossing: At 78 miles, runners must ford the American River near the Rucky Chucky crossing. The ford is dangerous and SHOULD NOT BE ATTEMPTED ON TRAINING RUNS. On Run Day, a guide rope will be stretched across the river, with personnel available for assistance. River rafts are used in high-water years. Wilderness: The remoteness of the trail can lead to disaster for anyone not experienced in the “backwoods.” For your own well-being and survival, we recommend that you do not attempt a training run alone without letting someone know exactly where you are going and what time you will return. Trail markings will not be completed until a few days prior to the Run. We strongly advise people who are unfamiliar with the area to buddy up with a “native guide.” Carry ample fluids, a water filtration pump and food supplies. There are dry stretches of over 8 miles during the Run and of 16 or more miles during training runs. Trail Markings: Trail markings will consist of pink surveyor’s tape tied to branches, “W.S. TRAIL” signs nailed to trees, and arrows and signs. (“Pioneer Express Trail” markers are located along portions of the trail. Do not refer to these as Run markers.) 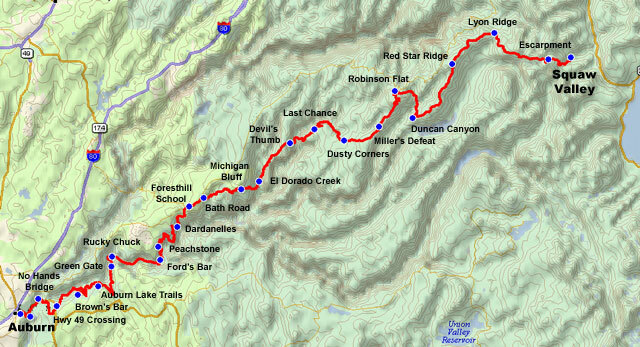 In addition, reflectors will be placed along the last 38 miles of the trail for the dark hours. Run Management does its best to provide an adequately marked trail, but it is necessary for runners to continually remain alert as they travel. On occasion, persons not associated with the event have altered or removed course markings, or Run management cannot place signage at a critical turn on Run day due to unusual circumstances. A working knowledge of the trail, particularly of those miles that will be covered in the dark, will be of infinite benefit to the runner who attempts the Western States Endurance Run. YOU are ultimately responsible to follow the correct course. Drops: If you have to drop out of the Run at a point where your crew is unavailable, we will make every reasonable effort to get you to the finish or to the nearest major checkpoint that is still in operation, particularly if you are in need of medical attention. In non-emergency situations, you may have to wait several hours before being evacuated. Runners having to drop from the Run BEFORE the Foresthill aid station will be taken to Foresthill. Runners having to drop AFTER Foresthill will be taken to the finish line. Our principal responsibility is to put on a Run, not to run a shuttle service for non-finishers; so please be patient. Aid stations will close when the footed sweeps or drag riders arrive. Trail Etiquette: Please be courteous to hikers, other runners and horsemen. Collisions on these narrow trails may be disastrous. If you wish to pass another runner, ask for “trail right” or “trail left” before attempting to pass. Slower runners must yield the trail to runners wishing to pass. Horses may be spooked by the sudden appearance of a runner, with serious consequences to the rider. Stop and step off the trail to let oncoming horses pass. Runners should never pass a horse from behind without first notifying the rider. Volunteers: Approximately 1,500 dedicated volunteers help out at each Western States Endurance Run. They are truly the life-blood of the Run and will do everything possible to make your day a success. Many spend more hours out on the trail than do the runners themselves. Please be polite and make a point to thank them. Without the volunteers, there would be no Western States 100. The Western States Endurance Run is one of the most physically challenging events in the world and participation in it presents numerous medical risks, many of which can be extremely serious or on rare occasions fatal. Participation in this event is at the runner’s own risk. Although Run Management has experienced medical personnel at various points along the course, the inaccessibility of much of the trail may make it difficult or impossible for medical assistance to reach the runner in a timely fashion. Many sections of the trail are accessible only by foot, horse or helicopter. Each runner is encouraged to consult with his or her own personal care physician regarding any physical or medical limitations before attempting the Run. Runners’ weights will not be taken at check-in or at aid stations during the race. Rather than (potentially inaccurate) weight data, the medical staff will focus on how the runner feels and looks and his or her mental status at each medical aid station. It is important for each entrant to recognize the potential physical and mental stresses which may evolve from participation in this Run. Runners may be subjected to extremes of heat and cold. They may develop hypothermia, hyperthermia, dehydration, hypoglycemia, hyponatremia, disorientation and mental and physical exhaustion. Run Management and the medical staff strive to work with runners. They will do all they reasonably can to ensure “safe passage” to Auburn, but ultimately runners must understand their own limitations. This is one event where, as Dr. George Sheehan has said, it is better to follow the dictates of your body — not your ambitions! Adequate physical and mental conditioning prior to the Run is mandatory. If you have not been able to prepare properly, do not attempt to run! Runners should appreciate the risks associated with participation in this event. Actions may have to be taken on your behalf under extreme time constraints and adverse circumstances. We will make reasonable efforts to give assistance whenever possible. Ultimately and primarily you are in charge, and you are likely to be solely responsible for creating your own crisis that we must then respond to. Be careful, be responsible, and do not exceed your own abilities and limitations. IN THE EVENT THAT A RUNNER REQUIRES EMERGENCY EVACUATION BY GROUND or HELICOPTER-AMBULANCE, THE RUNNER ASSUMES ALL FINANCIAL OBLIGATIONS CONNECTED WITH THIS SERVICE. RUN MANAGEMENT IS NOT RESPONSIBLE FOR ANY DEBTS INCURRED. Some of the main risks of the Run, but certainly not all of them, are listed here. These should be understood and remembered by all runners, before and during the event. Please note that death can result from several of the risk conditions discussed below or from other aspects of participation in the Western States Endurance Run. Renal Shutdown: Cases of renal shutdown (acute renal failure) have been reported in other ultramarathons and have occurred in varying degrees in the Western States Endurance Run. Renal shutdown (known technically as acute kidney injury or AKI) occurs from muscle tissue injury which causes the release of the protein myoglobininto the blood. Myoglobin is cleared from the blood by the kidneys and will look brownish-colored in the urine, but it is also a toxin to the kidneys and can cause acute vasospasm in the small arteries that supply the kidneys leading to AKI as a result of rhabdomyolysis. Appropriate training is key to prevention of AKI from rhabdomyolysis, and adequate hydration is key to both prevention and treatment of AKI, a syndrome which can be worsened by the use of NSAIDs. Three Western States runners have required a series of dialysis treatments, and others have been hospitalized several days with IV fluids to correct partial renal shutdown. While usually reversible in healthy people, AKI may cause permanent impairment of kidney function. IT IS CRUCIAL TO CONTINUE HYDRATING FOR SEVERAL DAYS FOLLOWING THE RUN OR UNTIL THE URINE IS LIGHT YELLOW AND OF NORMAL FREQUENCY. The Terrible Three: WS research has demonstrated that starting the Run with a pre-existing injury, low training miles due to the injury, and masking the injury during the Run using anti-inflammatories such as ibuprofen, could very well earn the runner a trip to the hospital with acute renal failure. The lesson is simple; if you are determined to start the Run with an injury and low training miles, do not attempt to mask the pain with a pill. Let common sense be your guide and stop when your body tells you to stop. Heat Stroke/Hyperthermia: Your muscles produce tremendous amounts of heat when running up and down hill. The faster the pace, the more heat is produced. In addition to the generation of heat from metabolism, environmental heat stress can be significant during the Run. In 1989, radiated heat off the rocks measured at 114 degrees F. Heat stroke can cause death, kidney failure and brain damage. It is important that runners be aware of the symptoms of impending heat injury. These include but are not limited to: nausea, vomiting, headache, dizziness, faintness, irritability, lassitude, confusion, weakness, and rapid heart rate. Impending heat stroke may be preceded by a decrease in sweating and the appearance of goose bumps on the skin, especially over the chest. Heat stroke may progress from minimal symptoms to complete collapse in a very short period of time. A light-colored shirt and cap, particularly if kept wet during the Run, can help. Acclimatization to heat requires approximately two weeks. We recommend training 90 minutes in 90 degree F heat or greater for at least two weeks prior to the Run if at all possible. If signs of heat exhaustion occur, we recommend rapid cooling by applying ice to the groin, neck and armpits. Risks Associated With Low Blood Sodium: Low blood sodium concentrations (hyponatremia) in ultramarathon runners have been associated with severe illness requiring hospitalization and several deaths among participants of shorter events. Generally, those individual who are symptomatic with hyponatremia have been overhydrating. But, hyponatremia may occur with weight gain and weight loss, so weight change is not helpful in making the diagnosis. Because of the release of stored water when you metabolize glycogen stores, you should expect to lose 3-5% of your body weight during the run to maintain appropriate hydration. It is important to note that hyponatremia may in fact worsen after the Run, as unabsorbed fluid in the stomach can be rapidly absorbed once you stop exercising. Signs and symptoms of hyponatremia may include bloating, nausea, vomiting, headache, confusion, incoordination, dizziness and fatigue. If left untreated, hyponatremia may progress to seizures, pulmonary and cerebral edema, coma and death. The best way to avoid developing symptomatic hyponatremia is to not overhydrate. There is no evidence that consuming additional sodium or using electrolyte-containing drinks rather than water is preventative of exercise-induced hyponatremia. If symptoms develop, one needs to assess whether they are due to overhydration. If that is the case, then stop fluid intake until you remove excess fluid through urination. If severe symptoms present, this is a medical emergency. The runner should be treated with intravenous hypertonic saline and transported to a hospital. Since the typical fluid used for intravenous hydration (referred to as normal saline) can exacerbate exercise-associated hyponatremia, we try to avoid such treatment at the Run unless we are certain that the individual is not hyponatremic. Snow Hazards: Snow levels in the high country vary greatly from year to year. Wear shoes with good gripping characteristics, but falling will still be likely. Snow conditions may vary from soft and slushy to rock-hard and icy. Run slowly and with particular care and concentration in the snow. Sun glasses are highly recommended if considerable snow will be encountered. Effects of Cold/Hypothermia: Temperatures may be near zero in the high country and drop into the 40-degree to 50-degree range during the night portion of the Run. Hypothermia is a potentially serious risk, especially at night since one’s energy reserves will have been depleted from 20 or more hours of running. Hypothermia can strike very quickly, particularly when pace slows from exhaustion or injury. The initial warning signs of hypothermia often include lethargy, disorientation and confusion. The runner will feel very cold with uncontrolled shivering and may become confused, unaware of the surroundings, and may possibly be an immediate danger to themself. Staying well-nourished, adequately hydrated and appropriately clothed will help avoid hypothermia. It is important that runners have access to warm clothing through their support crews, drop bags, or both. Wildlife Hazards: Rattlesnakes, bears, mountain lions and other potentially hazardous forms of wildlife live on the course and have surprised runners in the past. Keep alert and be careful where you place your feet and hands, especially at night. Bath Road to Foresthill: This portion of the trail parallels Auburn-Foresthill Road. There is a wide shoulder with trail; run on it. Mosquito Ridge Road: 0.6 miles after leaving the Foresthill Aid Station, the trail crosses Mosquito Ridge Road, which sees heavy traffic. The crossing has good visibility; stop and look both ways! Highway 49: The most dangerous road crossing in the Run is at Highway 49 (93.5 miles into the course). This is also a checkpoint; so there are volunteers and crews available should you require assistance. Traffic is generally heavy. The crossing has good visibility in both directions; once again, stop and look both ways. You will make this crossing at night and in a fatigued condition. Robie Point to the Finish Line: The last 1.3 miles of the course are run on the city streets of Auburn. The streets are residential and traffic is light, but run with caution. Use of Drugs: No drugs of any kind should be taken before, during or immediately after the Run! Many drugs can increase the risk of heat stroke. A partial list of problem drugs includes amphetamines, tranquilizers, and diuretics. It was necessary to remove one entrant from the Run in 1984 because the runner received an injection to help alleviate nausea and vomiting. This runner was at severe risk without realizing it. There is little known about drug reactions with the stress of running 100 miles. Injuries From Falling: Falling is an ever-present danger on the Western States Trail, with potentially serious consequences. Much of the trail is narrow, uneven and rutted. Altitude Sickness: High altitude plus exertion can produce various degrees of high altitude sickness. This has the potential to progress to severe lung and brain swelling, resulting in death but is unlikely to present more than an annoying headache during the limited time you will be at adequate altitudes to cause symptoms. The initial treatment is to seek a lower altitude, which you will naturally be doing on this course. Rhabdomyolysis: It has been found that some degree of muscle cell death in the legs occurs from participation in the Run. The recovery can take several months. This seems to be a bigger problem in runners who have exerted themselves beyond their level of training. Medical analysis of blood samples taken from Western States runners shows that this occurs to some degree in all runners. Overuse Injuries: Obviously, innumerable overuse injuries can occur, especially in the knee and the ankle. Sprains and fractures can easily occur on these rough trails. Blisters have prevented many participants from finishing. Common Fatigue: One of the dangers you will encounter is fatigue. Fatigue, combined with the effects of dehydration, hypothermia, hyperthermia, hyponatremia, hypoglycemia, sleep deprivation and other debilitating conditions can produce disorientation and irrationality. Poison Oak: Poison oak can be found in abundance along several sections of the trail, particularly the last 30 miles. Difficulty in Gaining Access to or Locating Injured Participants: Much of the Western States trail is remote and inaccessible by motor vehicle. Accordingly, in spite of the many layers of safety precautions instituted by Run Management (including radio communications, rescue helicopters on standby, foot patrols, mounted search and rescue personnel and other emergency services and medical personnel at many checkpoints), there is absolutely no assurance that aid or rescue assistance will arrive in time to give you effective assistance should you become sick, incapacitated or injured. In previous years, ambulances and other emergency vehicles have experienced difficulties in gaining access over remote roads jammed with crew vehicles, and other delays have resulted. Getting Lost: Although Run Management endeavors to mark the Western States course, it is definitely possible to lose the trail. If you believe at any time that you may not be on the correct trail, do not attempt to find your way cross country. If you are sure of your route, backtrack to where you last saw a trail marker and try to find other markers showing the direction of the trail. If you are unable to find your way, stay where you are! Wandering randomly will likely take you farther from the trail and reduce your chances of being found. If you do become injured, exhausted or ill, STAY ON THE TRAIL. You will be found there either by another runner, the Safety Patrol, or by the Sweep Riders of the Sierras, who monitor the progress of runners during the event. If you feel dizzy, disoriented or confused, do not risk falling. Sit or lie down on the trail until you recover or are found. An unconscious runner even a few feet off the trail could be impossible to find until it is too late. If you are assisted by individuals who are not associated with Run Management and you elect to leave the trail, you MUST notify the official at the nearest checkpoint of your decision to withdraw and surrender your official wristband and pull-tag. Although medical and other personnel will assist you when possible, remember that you are ultimately responsible for your own well-being on the trail. Only you will know how your body and mind feel at any given time. Monitor yourself during the entire Run, and prepare yourself to drop out at the nearest check-point if you find it just isn’t your day. As you continue past each medical checkpoint, be aware of the number of miles to the next one, realizing that getting rescue vehicles into these areas can be difficult, if not impossible. Remember that several of the winners of the Western States have dropped out in some years but have come back to win in others. Since 1998, WSER has required eight (8) hours of volunteer service by each Run Entrant. Performance of this requirement can be in the form of trail maintenance or volunteer services at any official running event. The WSER Board has a strong preference that runners perform their service in support of an ultra or doing trail work on a trail used in an ultra, but will accept service provided to any organized running event or trail work done on any trail commonly used by runners. Note: pacing, crewing or coaching other runners does NOT qualify as volunteer service. Volunteer service must be performed between March 1 of the year prior and June 1 of the Run year. Service must be verified by an official of the event served. Entrant is responsible for obtaining certification on this form and for mailing it to the address below. This form must be received no later than June 1 of the Run year, or the Entrant will not be permitted to participate in the Run. Please do not send us the form until and unless you are registered for the race. Click here for confirmation we have received your form. This is updated infrequently. The purpose of these rules is to ensure the Run’s integrity as a test of individual performance, providing equal conditions for all. The guiding principles of the Performance Rules are as simple as: play fair, be safe, and respect the land. Violations of any rules or directives of the Western States Endurance Run may be grounds for disqualification for one or more years, or other sanctions such as time penalties, fines, and/or disqualification from age group awards. There will be no unofficial runners. Each runner’s official run number must be worn prominently on the front of the body and must be easily visible at all times. Runners must follow the marked trail at all times. Any runner departing from the official trail must return to the point of departure on foot before continuing. Each runner must complete the entire course under his or her own power. No physical or mechanical aids are allowed, including but not limited to ski poles, hiking sticks or crampons. No additions can be made to shoes as manufactured. Except in case of medical emergency, runners may not accept aid or assistance in any form from anyone between checkpoints. Runners may not store supplies of any kind along the trail. Runners are responsible for the actions of their crews and pacers. Everyone associated with the Run must comply with all Run rules (Performance Rules, Pacer Rules, Crew Rules), regulations issued by the Race Director in pre-Run emails and at the pre-Run briefing on Friday afternoon, and all parking and access instructions, or risk disqualification of the runner. Each runner must be checked IN and checked OUT of all checkpoints. All cut-off times will be strictly enforced. Runners must be checked OUT of the checkpoint BEFORE the cut-off time. Runners returning to the checkpoint after the cut-off time will be pulled from the Run. All runners must undergo brief medical examinations at designated checkpoints. Additional monitoring of individual runners may be required at the discretion of medical personnel. Refusal by the runner to cooperate fully may result in immediate disqualification. Medical personnel have complete authority to evaluate the condition of any runner at any time and to determine whether the runner may continue. In addition to information provided by the runner in the Run application’s medical questionnaire, each runner must fully disclose to medical personnel at the pre-Run check-in any changes to existing medical conditions and all prescription medications being taken. Injection of fluids or drugs (intravenous, intramuscular, subcutaneous) during the event may result in immediate disqualification. Littering of any kind is prohibited. Please respect the natural beauty of our trails and the right of everyone to enjoy them. Littering will threaten our continued use of the Western States Trail. Runners must refrain from any act of bad sportsmanship. Smoking is not permitted at any of the checkpoints or along the trail. Any runner who is unable to finish the Run must personally inform the aid station captain of the nearest checkpoint of his or her decision to withdraw. The runner must give the wristband (issued at the pre-Run medical check-in at Squaw Valley), to the captain at that time. The wristband serves as official notice of a runner’s withdrawal from the Run. Runners who leave the course without turning in their wristband will be classified as “lost,” thereby potentially activating the Placer County Search and Rescue unit. Time spent searching for any such runner may be billed to the runner. Runners crossing the finish line after the 30-hour cutoff will not be listed as official finishers. The Western States Endurance Run has a zero-tolerance policy regarding the use of performance enhancing drugs (PEDs). Any athlete who has been determined to have violated anti-doping rules or policies, whether enforced by the International Association of Athletics Federations (IAAF), the World Anti-Doping Agency (WADA), U.S. Anti-Doping Agency (USADA), or any other national sports federation is ineligible for entry into the Western States Endurance Run. The Western States Endurance Run reserves the right to conduct pre and post-competition testing for any and all performance-enhancing drugs (PEDs) listed on the current WADA Prohibited List. Any athlete who refuses to submit to anti-doping controls, if selected for testing, shall be disqualified and subject to a lifetime ban from the Western States Endurance Run. Report the alleged violation to the runner, their crew or pacer as the incident occurs. Enlist a fellow witness to the alleged violation if possible. Report the alleged violation with the runner’s name and number to the next available aid station captain. Report the alleged violation in writing at the finish line to the Race Director. All protests must be submitted by 11:30 a.m. on Sunday following the Run. Written protest must include the name of the person who lodged the complaint. Both parties will be invited to discuss the complaint with the Western States Protest Committee at noon on Sunday, when a decision about whether to withhold the alleged violator’s award will be rendered. A final resolution of the issue may be made by the full Western States Board of Trustees approximately two weeks after the Run. Crews must follow all of the rules and regulations of the Run, including the Performance Rules, Pacer Rules, the following Crew Rules and any supplementary instructions issued in pre-Run memos or at the Friday afternoon briefing. All crew members must willingly comply with all instructions from Run personnel at all points along the trail and its access routes, including parking regulations, or risk disqualification of their runner. A crew member is defined as any individual who provides material support to a runner in the event. Crews may meet runners or assist them only at those aid stations specifically designated for crews. Crews must wait to assist their runners until after the official check-in and medical evaluation (where applicable). Crews must adhere to instructions of all aid station personnel, including requests to vacate a certain area of the checkpoint. Crews must stay within a 200-yard radius of the aid station while attending to their runners. Exceptions: Crews may assist runners: 1) from bottom of Bath Road to the intersection of Foresthill Road and California Street; 2) from the Rucky Chucky far side to Green Gate; 3) from Robie Point to the finish line. Crews may assist runners in designated areas located on both sides of the Rucky Chucky river crossing. No crews are allowed at the following checkpoints: Lyon Ridge, Red Star Ridge, Miller’s Defeat, Last Chance, Devil’s Thumb, El Dorado Creek, Dardanelles, Peachstone, Ford’s Bar, Auburn Lake Trails, and Quarry Rd. Crews will be limited to one vehicle per runner at all checkpoints except Foresthill. Due to narrow access roads, motor homes will not be permitted into any checkpoints. The only exception is Foresthill. No crew vehicles will be allowed into Deadwood Ridge, down Bath Road, to the Rucky Chucky river crossing (both sides of the river), to the Green Gate, 49 Crossing and Robie Point. Approximate distance from parking areas to “foot access only” checkpoints: Rucky Chucky — north (near side): Shuttle bus; Rucky Chucky — south (far side): 3¼ miles; Green Gate: 1¼ miles; Pointed Rocks: 3/4 mile. Crews must always drive at safe speeds! No matter how fast a runner may be, it is possible for crews to arrive at all the major checkpoints without exceeding the posted speed limits. Speed limits are rigidly enforced by the U.S. Forest Service, California Highway Patrol and the Placer County Sheriff’s Dept. The speed limit between Foresthill and Robinson Flat varies from 25 to 45 mph. Speeders may be cited! Crews must never park in such a way as to block traffic, access to the trail or checkpoint, or other parked cars. Vehicles will be towed at the owner’s expense, and their runner may be immediately disqualified. Bicycles are permitted to access aid stations. Bicycles cannot be used to pace a runner or on any part of the Western States trail. No pets or dogs will be allowed at any of the checkpoints, the finish line, or along the trail. Pets cannot be left unattended in crew vehicles. No smoking will be allowed at any of the checkpoints or along the trail. Littering of any kind at any checkpoint, along the trail, or at the finish line is strictly prohibited. A pace runner, or pacer, is defined as a “trail companion” who may accompany a runner along designated sections of the trail. Pacers are allowed solely as a safety consideration for fatigued runners in the remote and rugged territory of the Western States Trail. Absolutely no physical or mechanical aid may be given by the pacer to assist the runner over difficult sections of the trail (except in medical emergencies), and no food, fluids or supplies of any kind may be carried for the runner. Pacers should be experienced trail runners in excellent physical shape and conditioned adequately to run 40 miles over rough terrain. Most pacing will be done during night time hours and early morning; so pacers should be warmly dressed, used to running with flashlights, and familiar with the trail. Pacers should be adequately supplied with flashlights, food and water. They may accept aid at the checkpoints. A pace runner is any individual who accompanies an entrant for any distance greater than 100 yards at one time. Runners leaving Michigan Bluff after 8:00 p.m. may be paced from that point. All crew members, pacers and fans may accompany a runner from the bottom of Bath Road to the intersection of California Street and Foresthill Road, from the Rucky Chucky far side to the Green Gate aid station, and from Robie Point to the Finish Line. Each pacer must sign a release form at Pacer Central, either at Squaw Valley on Friday morning or at the Foresthill Elementary School after noon on Saturday. Each pacer must wear the official identifying number that corresponds to the Run number of the entrant he is pacing. Three pacer numbers are provided per entrant. Pacer numbers may be picked up at either Pacer Central location. All pacers must clearly identify themselves when passing through control points. It is extremely important that Run personnel know exactly who is on the trail and where. Pacers must stay with their runners at all times, except in the case of an emergency. If the runner withdraws from the Run, and the pacer wishes to continue, he/she must remain at the aid station until another runner enters the aid station and requests the services of a pacer. The pacer may not continue on without an official Run participant. Changes of pacers may be made only at the following designated locations: Foresthill School, both sides of the Rucky Chucky river crossing, the Green Gate, Pointed Rocks, No Hands Bridge and Robie Point. Pacers must enter and leave each aid station WITH their runners. They may assist with the re-filling of water bottles or replenishment of supplies while in the station but may not come into the checkpoint ahead of their runners, or depart after their runners, in order to speed up the re-fueling process. Pacers may not carry water, food, flashlights, shoes, clothing or other supplies for anyone other than themselves. “Muling” is expressly forbidden. No mechanical or physical assistance may be given by the pacer to the runner at any time. Please respect the trails; littering of any kind is strictly prohibited. PACERS MUST COMPLY WITH ALL RUN RULES AND REGULATIONS, INCLUDING THE PERFORMANCE RULES, RULES FOR PACERS AND ALL INSTRUCTIONS FROM RUN PERSONNEL. Perhaps the one thing that stands out most in the memories of every runner who participates in the Western States Endurance Run is the incredible volunteers who work the aid stations. With a staff of over 1,500 volunteers, the support given to the runners is unparalleled. The river crossing alone has a team of 125 personnel. There are 21 aid stations, including 10 major medical checkpoints along the course. The aid station captains have many years of service at Western States and are professionals. The aid stations are well stocked with fluids and a variety of foods. The fluids that are generally available are: water, Clif Shot Hydration Drink, Clif Shot Recovery Drink, Sprite® or 7Up® and Coke®. The night aid stations will also have soup, hot coffee and hot chocolate. The foods that are generally available are: salt replacement foods (saltines, pretzels, chips), Clif Bars, Clif Mojo Bars, Clif Shot Energy Gels, Clif Shot Bloks, fruits (oranges, bananas, melons), potatoes, cookies, candies, sandwiches, etc. Hot soup will be available at several of the aid stations, including the River Crossing, Auburn Lake Trails and Pointed Rocks. Western States is now a cupless race. Bring your own cup or use your bottles if you wish to drink at the aid stations. There will be hot cups available for soup. There will also be a few shared plastic “community cups” for cold drinks. The use of Ibuprofen (Advil, Motrin) or Naprosyn can lead to kidney problems when used in abundance and/or under stressful conditions such as running a 100 mile run. We will not provide these medications at our aid stations. If you feel the need to bring and use your own pain medications or anti-inflammatories, then you are willing to assume the responsibility for their use. Our medical staff also has many years of service at Western States. With a staff of approximately 50 physicians, 75 nurses, podiatrists, emergency medical technicians, paramedics and massage therapists, we try to provide the safest and best medical backup available. Some of these people have been participants in the Run, making them all the more aware of the needs of the runners. Without the assistance of these 1,500 invaluable volunteers, there would be no Western States Endurance Run. Many of these volunteers have spent days preparing for the Run and will be at their stations for over 30 hours. They have given up their day to insure you the best possible chance of success. They have given up their weekend to insure you the best possible chance of success. Giving each volunteer the courtesy, respect and sincere thanks that they each richly deserve is all that we ask. Estimated Pace for Leader, 24 hour, and 30 hour runners is based on past experience, but may vary significantly due to temperature and humidity conditions in the canyons. Cut-off times reflect the deadlines for LEAVING the aid station. If you return to an aid station after the cut-off, you will be pulled from the Run. The cut-off times will be strictly enforced by the Cutoff Coordinators or Aid Station Captains. Anyone leaving an aid station after the cut-off time will be disqualified. This rule is for the safety of all participants. IF YOU MISS THE CUT-OFF, YOU MUST STOP. Significant sanctions will apply to anyone breaking this rule. *Cutoffs denoted with an asterisk are default cutoffs. The cutoff is identical to the cutoff at the next aid station. These cutoffs are intended for emergency use at hard to access aid stations and must be respected. It should be noted that cutoff times are not intended to be a pacing guide. They are quite generous, especially early, and slower runners should focus on the 30-hour time not the cut-off time. If you’re close to the cut-offs you’re in trouble! Run Management will provide transportation for drop bags to the locations specified on the Checkpoint Chart above. This service is provided to aid crewless runners. Those with adequate support are asked not to overload our volunteers with unnecessary drop bags. Drop bags must be securely tied, labeled clearly with the runner’s name and entry number, and deposited at the appropriate collection station established for each checkpoint on the Friday preceding the Run. Drop bags must fit through a 6″ X 8″ opening and can be no longer than 16″. You are limited to one drop bag per aid station. Pacers are not allowed drop bags. 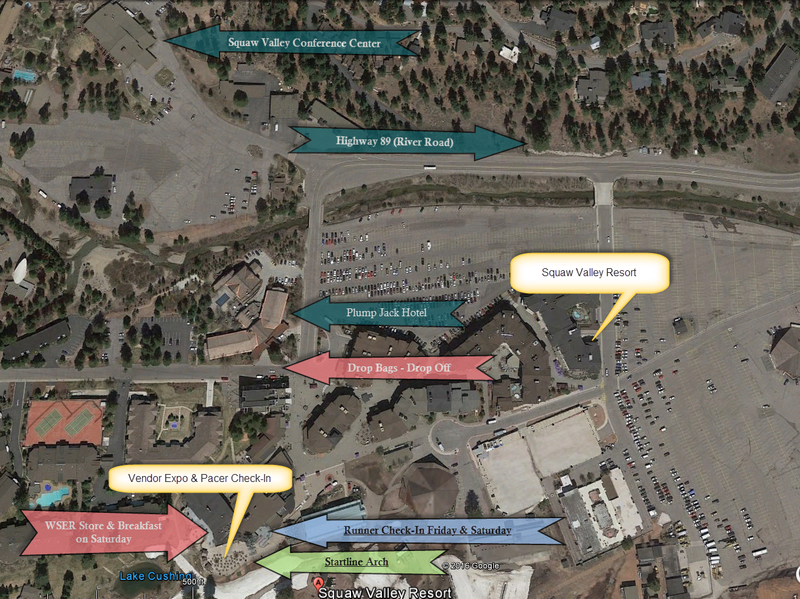 The collection station is located near the corner of Squaw Peak and Squaw Valley Road (near tram building), for Run Day distribution. Drop bags must be left between 9:00 a.m. and 1:00 p.m. Please do not use paper bags, shoe boxes, or anything made of paper-like products. These can get wet and tear easily. It is imperative that runners do not leave perishable items in their drop bags. It is strongly recommended that warm clothing and an extra flashlight be placed in the drop bags that will be delivered to each of the night aid stations. Do NOT place glass bottles in your drop bags. We cannot facilitate pacer drop bags. Pacer supplies must fit in the runner drop bags. The drop bags will be returned to Placer High School stadium as soon as possible. It is the responsibility of each runner to claim his or her drop bags. If you cannot retrieve your drop bags, have someone else do it for you. Drop bags must be claimed by 3:00 PM, Sunday. Drop bags are located on the infield of the Placer H.S. track (finish line). Any drop bags remaining at the track following the event may be disposed of. DO NOT leave valuables in your drop bags. Run Management is not responsible for lost or damaged drop bags and their contents. 9:30 a.m. WESTERN STATES WELCOME ~ Join Race Director Craig Thornley, WSER Foundation President John Medinger, members of the WS Board of Trustees, veteran buckle winners, and superstar WS volunteers in the amphitheater near the Vendor Expo for some Western States hospitality! Bring your crews, pacers, and fans — Everyone is welcome! 10:00 a.m. TREK TO EMIGRANT PASS (Mo Livermore and Tony Rossmann) ~ Gather at the Start Line Arch. Run, walk or ride the tram to the summit (mile 4.0 on the course) for unique inspiration, amazing views and special Western States camaraderie. Wear layered clothing and trail shoes. Short program will begin at Watson Monument at high noon. Please note: A climb of 2,550 feet in four miles to an elevation of 8,750 feet, the trek to the summit can take up to two hours. Walking distance to Emigrant Pass from High Camp, the terminus of the tram, is about one mile (550 feet of altitude gain). In snow years, an alternate site on the mountain may be used. 5:00 p.m. Women of WSER Q&A Panel hosted by Trail Sisters – (Hosted by Gina Lucrezi) Join in our Q&A with 2019 female WSER participants. Learn about their journey in preparing for WSER, what WSER means to them, their thoughts on women’s participation in trail running, entry barriers and other interesting topics within the sport. Bring your questions and add to the discussion! 9:00 a.m. – 1:00 p.m. RACE REGISTRATION ~ located near the Start Line Arch at the Olympic Plaza. Attendance by all runners is mandatory. 9:00 a.m. – 1:00 p.m. DROP BAG DELIVERY ~ Runners must leave drop bags at the collection area near the corner of Squaw Peak and Squaw Valley Road (near the tram building) for Race Day distribution to checkpoints. Be sure to read important drop bag details. 10:00 a.m. Altra 6K UPHILL CHALLENGE ~ meet at the Start Line Arch. 2:00 p.m. RACE MEETING ~ at the Squaw Valley Conference Center. Attendance by all runners is mandatory. 3:30 a.m. COMPLIMENTARY BREAKFAST ~ served inside the Olympic Plaza near the Start. 4:00 a.m. – 4:50 a.m. PRE-RACE CHECK-IN and BIB NUMBER HAND-OUT ~ located inside the Olympic Plaza. Mandatory. Any runner not checked in will be disqualified. 5:00 a.m. SILVER BUCKLE WINNERS HAVE FINISHED. 11:00 a.m. BRONZE BUCKLE WINNERS HAVE FINISHED. END OF RUN. 8 a.m. – Noon. CELEBRATION BREAKFAST ~ served at the Finish Line. Free to all entrants and volunteers. Crews, pacers, families and fans welcome; donations appreciated. 12:30 p.m. PRESENTATION OF AWARDS near the Finish Line at the Placer High School track. IMPORTANT: If you are unable to attend the awards ceremony, please have someone else attend in your place so they can pick up your buckle for you. Finisher buckles may not be picked up early as finisher names are being engraved on the buckles. If you would like your buckle mailed to you, a $35 mailing fee must be received in the WS office by September 1st. Drop bags must be claimed by 3:00 p.m., Sunday. Drop bags are located on the infield of the Placer High School track (the Finish Line). Any drop bags remaining at the track following the event may be disposed of. DO NOT leave valuables in your drop bags. What they had done, what they had seen, heard, felt, feared – the places, the sounds, the colors, the cold, the bleakness, the beauty. Til they died, this stream of memory would set them apart, if imperceptibly from anyone but themselves….